Comments - Fascinating and rare original "ema" or votive plaque painted by Clifton Karhu. Ema are small wooden votive plaques that are hung up at Buddhist or Shinto shrines for good luck. Literally "picture horse," ema originated with the custom of an individual donating a horse to a shrine or temple for good luck. This eventually became a picture of a horse on a wooden plaque, with space on the reverse to write a wish or a prayer. The plaque has a peaked top to resemble the outline of a barn for the horse. 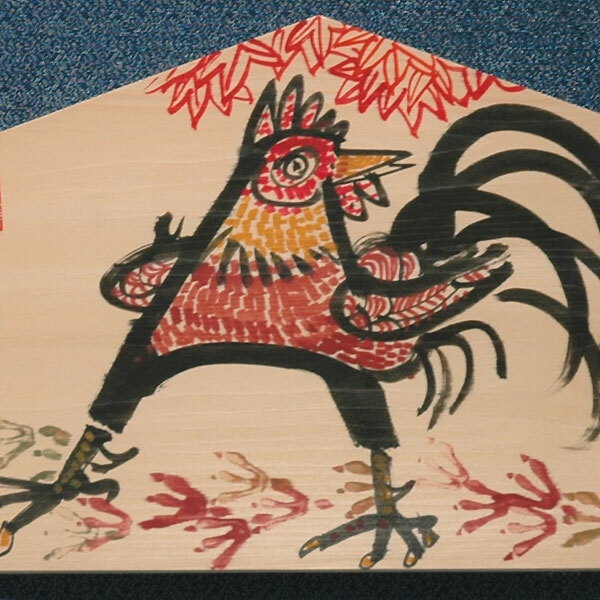 This design features a bold rooster beneath an autumn maple tree, with bird tracks running along the base of the image. The reverse includes the phrase "If you move your feet you get somewhere" in both English and Japanese. 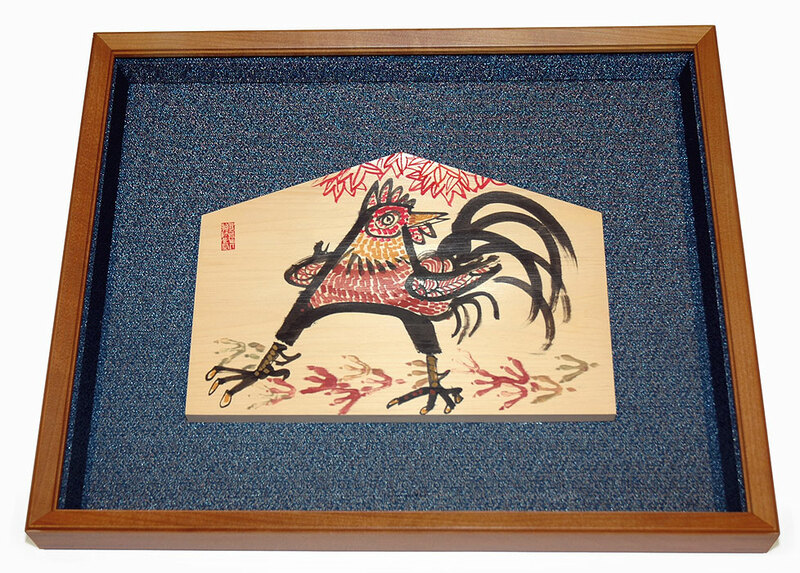 The rooster may be the zodiac animal for the year, or it may be associated with a particular shrine. 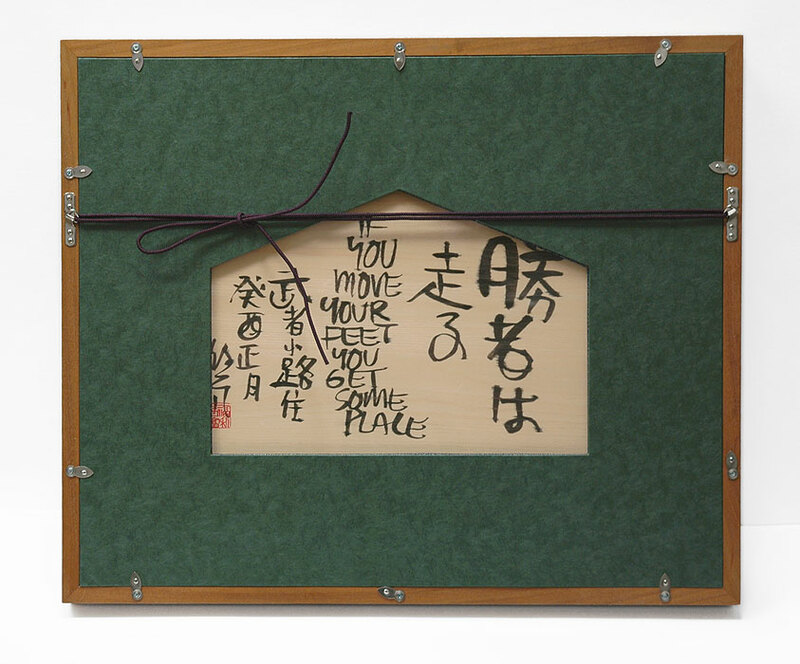 The plaque is beautifully mounted in a Japanese wooden shadow box frame with an opening in the mat on the back to view the writing. The box is lined with a dark blue and metallic gold fabric, with Plexiglas on the front and back. The frame slides into a yellow cloth bag, which fits into a traditional cloth-covered case with toggle closures. A fascinating, unique item that would make an incredible addition to a Clifton Karhu or modern Japanese woodblock collection. A real conversation piece and a great choice for display. Size - Plaque 9 1/4" x 13" x 5/8"; frame 17 7/8" x 21 1/2" x 1 7/8"; outer case 18 1/2" x 22" x 2 7/8"